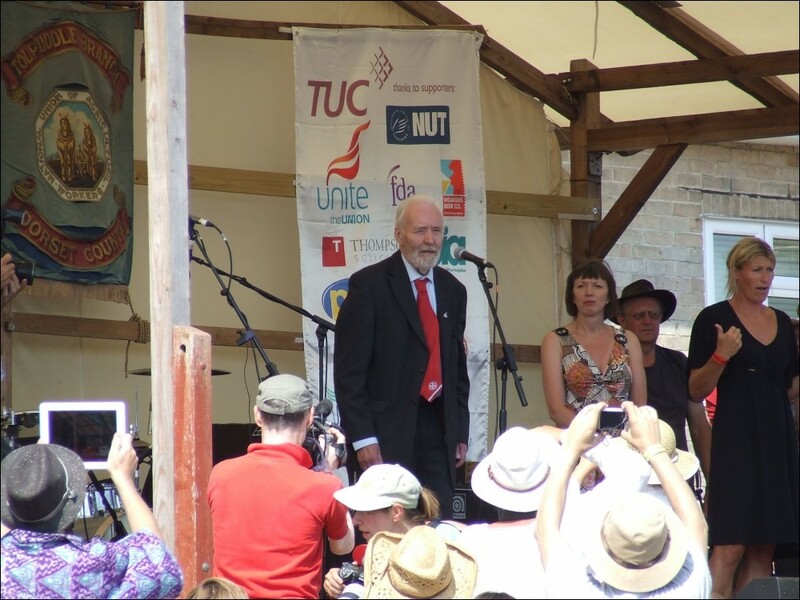 In one week, the labour movement has suffered two big blows with the deaths of trade union left leader Bob Crow and now of Tony Benn. Bob Crow's death came as a shock, because he passed away at such an early age at the height of his powers and influence on working class people. Unfortunately, he has not lived to see the formation of a new mass workers' party (TUSC is a step towards this), which he fervently advocated and will be established in time. Tony Benn had recently been in ill health but his death comes as no less of a blow because of his association and lifelong work for the left within the labour movement. He was a powerful symbol and leader of the Labour left at its height in the 1980s, when it exercised a huge and sometimes decisive effect on events within the Labour Party and the trade union movement as well. Tony Benn's political evolution contradicted the dictum of the cynics, which holds it is only to be expected to be radical and on the left when you are young, but inevitably, as you get older, you shift towards the right. It was to his great credit that he defied this stereotype evolving from the centre-right to the left. The gallery of right-wing Labour apostates is large: Neil Kinnock and Tony Blair are examples of a recent vintage of this kind. Once an erstwhile leader of the Labour left, Kinnock was transformed into the darling of the capitalists and Labour right, as he put the knife into both the Militant tendency - now the Socialist Party - and then the miners. He received a handsome reward in gold - with the estimated income of him and his family now standing at £20 million - as well as a Barony! Blair is now 'worth' £100 million! Tony Benn stood on the centre-right in Harold Wilson's Labour government of 1964-70, when he supported Barbara Castle's anti-union legislation 'In Place of Strife'. This was defeated by an uprising of Labour Party rank-and-file members and the colossal pressure of the trade unions. He shifted towards the left under the impact of the 1971 Upper Clyde Shipbuilders occupation, which he championed, as well as other workers' battles at that time, such as the miners' strikes of 1972 and 1974. At this time, Benn emerged as the major figure of the Labour left, supporting the ideas of nationalisation and workers' control of industry. He gave firm support to the Labour Party Young Socialists, led by Militant supporters. He worked together with Militant supporters, including Tony Saunois, Laurence Coates, Hannah Sell, Nick Bradley and others on the National Executive Committee of the Labour Party helping to shift the party decisively towards the left. 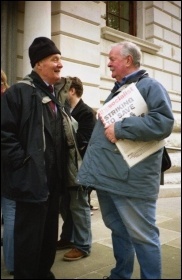 Tony Benn supported the demand for the nationalisation of the top 25 companies, which was carried on the NEC with the deciding vote of the LPYS representative. An indication of the left, socialist and radical mood at this stage was that even the leading right-winger at the time, Roy Hattersley, argued in favour of nationalising "North Sea gas and oil, development land and rented property". This seemed to indicate an almost unstoppable movement towards the left within the labour movement, not just in Britain but internationally. However, in September 1973 the left-wing Allende government in Chile was overthrown in the bloody Pinochet coup. 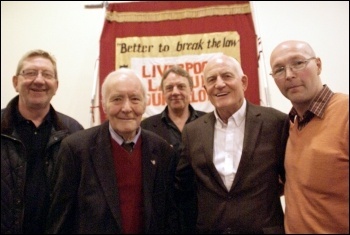 Jack Jones, General Secretary of the Transport and General Workers Union (TGWU, now part of Unite), remarked at a fringe meeting, with Tony Benn sitting alongside him, that he could perceive a situation where a Labour government led by Benn could come to power and be faced with the same kind of conspiracy as Allende faced in Chile. Tony Benn reflected the huge radicalisation that was taking place in Britain but also pushed it forward with his speeches and articles in favour of Labour adopting a socialist programme. These proposals did not go far enough for the Militant tendency. There were big elements of Allende's programme of limited nationalisation in the proposals of Tony Benn. They were a big advance over the outmoded ideas of the Labour right, but because they did not propose to take away the fundamental powers of the capitalists, the ownership of the monopolies, the capitalists would be able to prepare the ground for a decisive blow, as in Chile. However, throughout the 1970s, the left continued to advance both within the Labour Party and the unions as the campaign for Labour Party democracy scored important successes, with Militant and Tony Benn's supporters collaborating. This was despite the fact that the Labour right, prompted by big business, used the 1975 defeat of the left in the 'Common Market' (now the European Union) referendum, to move him from Secretary of State for Industry to a less influential position in the Cabinet as Energy Secretary. The experiences of that right-wing Labour government in turn prepared the ground for an even bigger shift towards the left within the Labour Party following its defeat in 1979. 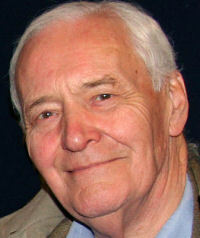 Tony Benn stubbornly resisted the right and put his full weight behind left, socialist policies. This culminated in his standing for the deputy leadership of the Labour Party in 1981, which he only lost by 1%, due to the betrayal of former lefts, like Kinnock, who voted for his opponent, Denis Healey, or abstained. This in turn led to the offensive of the Labour right through the 'Gang of Four', led by Roy Jenkins and David Owen, who subsequently split from the Labour Party and formed the Social Democratic Party. Their aim was to split the anti-Tory and Labour vote in the 1983 general election, which they succeeded in doing. This helped to maintain Thatcher in power and prepared the way for the emergence of a determined right-wing offensive within the Labour Party, backed by Thatcher and the press. 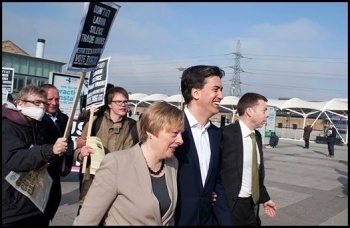 Their stalking horses were former lefts like Michael Foot and Neil Kinnock. However, this did not stop the election of three Militant supporters as Labour MPs in the 1983 and 1987 general elections, in which Tony Benn gave sterling support to their campaigns. Neither did it prevent the victory of the socialist Liverpool councillors between 1983 and 1987, nor the outbreak of the mighty miners' strike, with Tony Benn backing these causes to the hilt. However, following the defeat of the miners, the Liverpool councillors and the print workers at Wapping, the Kinnock 'counter-revolution' against the democratic rights of Labour Party members and socialist policies began in earnest. Kinnock's work was carried on by John Smith, then by Blair and now has been completed by Miliband with the elimination of the organised presence of the trade unions within the party that they founded. This inevitably led to the political isolation of the Labour left and of Tony Benn because it was part of a worldwide process, the roots of which lay in the collapse of Stalinism and, with it, the planned economy. This allowed the capitalists to conduct a ferocious ideological campaign against all the ideas upon which the labour movement was built: socialism, trade unionism and solidarity. It is to his great credit that Tony Benn steadfastly held on to his socialist and left opposition and for that he was held in great esteem. But his isolation and, therefore, loss of political influence, particularly amongst the younger generation, was increased because he clung to the Labour Party, which was no longer a political vehicle for working-class people. This comes through clearly in the remarks made by Tony in his recent and last diaries, which are disarmingly honest. 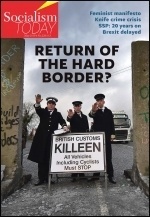 [See 'The Labour of Tony Benn', Socialism Today 174, December/January 2014.] He stated that a Tory election candidate revealed to him that when Norman Tebbit asked Thatcher what she regarded as her greatest achievement, she replied "New Labour". He comments in his diaries, "That says it all really." Yet, unfortunately he did not draw the necessary conclusions from this, that it was therefore necessary to take an entirely different road to the dead end represented by New Labour. He came very close, however, at times, to breaking from New Labour. For instance, when he was approached by representatives of Bob Crow, to support 'No to EU' in the European elections of 2009, he was initially favourable. But, unfortunately, pressure was exerted by his family, particularly by Hilary Benn, who warned him that he could be expelled from New Labour, which in turn would mean a possible breach with his family. This undoubtedly represented to him too much of a hurdle in a vulnerable period towards the end of his life. In his diaries, he commented at various stages that the Labour Party has been "assassinated". He conceded: "New Labour has come out more violently anti-union and anti-left than for many, many years... Constituencies are no longer on the left, because all the decent socialists have left, so it's a Blairite rump." [More Time for Politics, Diaries 2001-2007.] The conclusion to draw from this would surely be that the Labour Party is now irredeemable from a left and socialist perspective. It cannot be rescued in order to perform its original job as the political expression of the organised working class. This can only be done through a new mass party of the working class, with the trade unions in the lead. 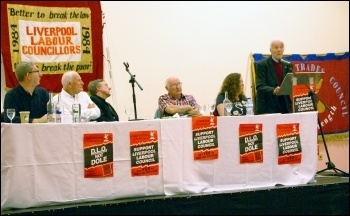 I spoke with Tony Benn, alongside Tony Mulhearn and Len McCluskey, last year at one of the last meetings he addressed. It took place in Liverpool to commemorate the 30th anniversary of the heroic struggles of the socialist city council and the working class of that city in the 1980s. This meeting witnessed the deep affection and veneration for Tony Benn; he had given them unswerving support in their hour of struggle and need, as he had done for the struggles of working people everywhere. We should use the example of his life to reaffirm once more our implacable opposition to the capitalist system and for a new socialist world. 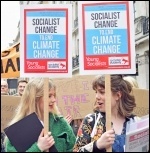 This version of this article was first posted on the Socialist Party website on 14 March 2014 and may vary slightly from the version subsequently printed in The Socialist.